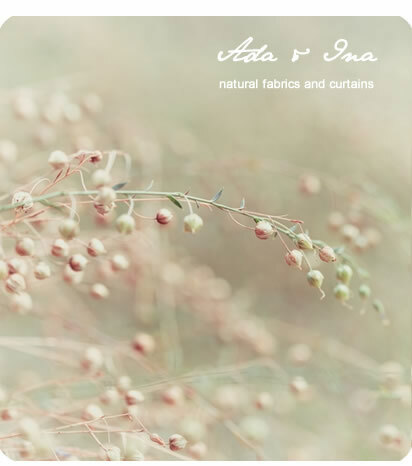 Ada & Ina 100% Natural Linen Fabric and Curtain Collection. You do not want to settle for anything less than perfect, when it comes to choosing furnishings for your house. Ada & Ina knows how to give that magical look and cosy feel to each corner of your house with our designer 100% natural linen curtains, linen upholstery fabrics, curtain fabrics, and linen blinds. We have sourced 100% natural designer fabrics for our fabrics collection, with curtain fabrics, upholstery fabrics, bed linen and accessories. Our fabrics are sourced from the best factories so you can buy linen bedding, linen fabrics, roman blinds and curtains easily online. Many of Ada & Ina linen fabrics are Oeko-tex® Standard 100 approved. Check out the curtains, fabrics, and bedding at our online fabrics store.